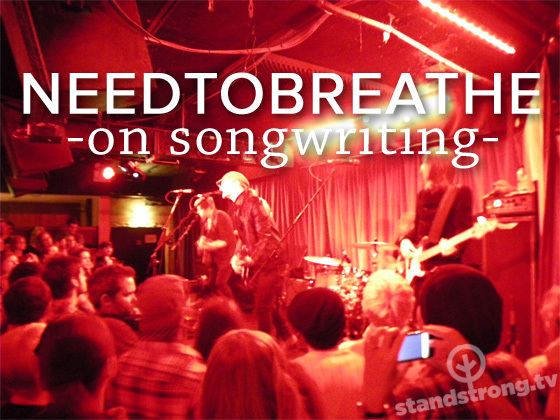 First time I saw NEEDTOBREATHE live in 2008 I was living in NYC and developing ideas for this yet unnamed website. I was, and still am, drawn to people who purposely choose not to please everyone. NEEDTOBREATHE is that kind of rock ‘n’ roll band – they write for the outsiders. Bo Rinehart enjoys breaking out his banjo, knowing full well some of the existing fans won’t enjoy the vibe; his brother, Bear, writes lyrics drenched in vulnerability, alienating some of the potential pop-radio fanbase. 0:10 – Do you start with the lyrics or the melody? 1:47 – Is there a specific message you try to pass on with your music? 2:48 – Have you alienated some people with your lyrics? 6:35 What do you want NEEDTOBREATHE to be remembered for a 100 years from now?